French Foreign Minister warns Iran that its plan to increase its uranium enrichment capacity takes it close to a "red line". French Foreign Minister Jean-Yves Le Drian on Wednesday warned Iran that its plan to increase its uranium enrichment capacity took it close to a "red line", AFP reported. On Tuesday, Iran notified the International Atomic Energy Agency (IAEA) that its Atomic Energy Organization is opening a center for producing new centrifuges for uranium enrichment at Natanz. It followed that move with a statement by Iran’s nuclear chief, Ali Akbar Salehi, who said that Iran would complete within a month the construction of a facility in its Natanz nuclear plant to build advanced centrifuges. 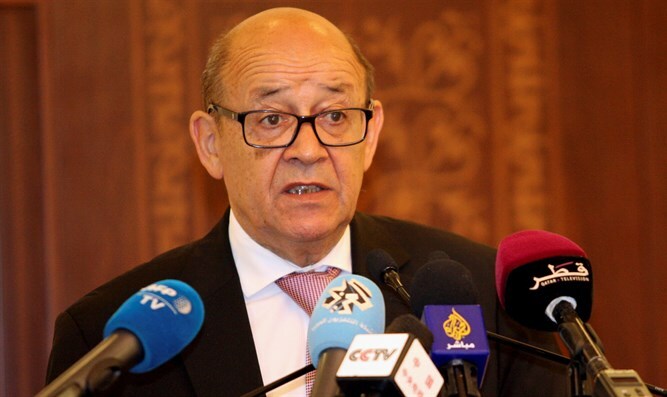 Le Drian called Iran's announcement that plans to boost its enrichment capacity "inopportune". "It is always dangerous to flirt with red lines," he said, according to AFP, though he stressed that these plans did not constitute a breach of the 2015 nuclear deal signed between Iran and world powers. The deal, which offers sanctions relief in return for guarantees that Tehran would not be able to build an atomic bomb, is hanging by a thread after the U.S. announced plans to restore sanctions, diminishing the incentive for Iran to remain on board. Le Drian warned Tehran on Wednesday that Europe would not be able to stand idly by if Iran takes its nuclear program "to the next level". "The Iranians must realize that if they violate the accord they will face new sanctions," he was quoted as having told Europe 1 radio. A spokesman for the German foreign ministry also described the plan as "not helpful at this time" saying it did not "contribute to the building of trust, in which Iran should also have an interest." On Tuesday, the European Union said a “first assessment” of Iran’s uranium enrichment plan indicated it does not breach its commitments under the 2015 nuclear deal.